Cool and foggy at first, then mild and sunny. I slept long, but woke up quite a few times during the night. The floor of my lightweight tent is slippery and, because it was pitched on a slight slope, my air mattress kept sliding down to the bottom of the tent. I need to put something on the tent floor to make it stickier. Anyway, I rose at 6:30am in the pre-dawn light to find a light fog and very still air. Ghostly. 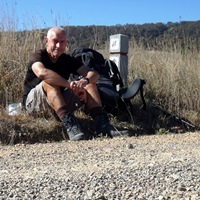 The previous evening I had finally spoken to Steve, the ferry man at Burrinjuck, and he said that the earliest he could ferry me across Burrinjuck Reservoir was 3:30pm, about two hours later than I had hoped. This took the pressure off me for an early departure and I had a leisurely breakfast and packed up, leaving the campsite as the sun burnt off the fog at 8:30am. Two kilometres later, I became less leisurely when I remembered that I had left my waterbag back at the campsite. I don't use it to carry water while hiking, but it's very useful around camp and I did not want to lose it. So, after a few curses, I hid my pack behind a tree by the road and began to jog and walk back to the campsite where I retrieved the bag. The round trip took about 40 minutes making it likely I would not now reach the Burrinjuck Store until after 2pm. Suddenly, I was glad the ferryman was not booked for 1pm. Thereafter, I had a very pleasant walk along rural back roads, frequently shaded by trees with almost zero traffic until I reached the boundary of Burrinjuck State Park and the track became more of a fire trail as it descended through forest until nearing the shore of Burrinjuck Reservoir. At that point my route left the fire-trail and became a foot-trail that followed the shore for about 5 kilometres around to Burrinjuck Waters camp. The Reservoir was very low and this meant there was a cleared rocky sloping area between the forest and the water all around the Reservoir which, to my mind marred the spectacular scenery just a little. At the camping area I found my way to the Store and was greeted by the friendly proprietress who confirmed that Steve the ferryman was expected at 3:30pm. It was now 2:30pm, so I bought some lunch and a paper and sat outside in the sun at a picnic table and enjoyed the warmth and mountain scenery. A couple of kangaroos loitered outside the store and the proprietress turned on some music for me. Very pleasant. Steve arrived a little late and very apologetic before towing his small boat down to the boat ramp, along with a visitor. We launched about 4pm for the fast trip across the Reservoir to a point on the southern shore where he dropped me off. The low water level meant he couldn't take me as far as I might have hoped, but he did his best, dropping me off on a barren shore and pointing out a gravel road in a saddle which I should make for. After wending my way cross-country over the barren shore, I finally reached the track and then followed it south across some farms until it finally reached a more-travelled road and I found a Hume & Hovell marker confirming I was heading in the right direction. The sun had set and I enjoyed walking through the rural landscape in a valley bordered by forested mountains in the increasing gloom. My feet were starting to get quite tired and I kept peering into the distance hoping to see some lights that might be from the tavern I was heading for. Soon it was dark and I was on a sealed road with just enough star light to stay on track. I had a headlamp, but preferred to rely on the ambient light and not to use it unless absolutely necessary. I did nearly miss the turn-off to the tavern before arriving there at 6:30pm. There was very loud juke-box music playing and I was told that they had given my room to someone else because I was later than scheduled. I had thought about phoning ahead when I knew the ferryman was going to be later, but decided against it. Bad decision. It also turned out that the proprietress was unwell and not about. However, what seemed like a problem was soon resolved by some very helpful people and the proprietress, who got out of her sickbed, and I was given some dinner and a TV to watch in the rustic bar (as the sole occupant) while they sorted out another room for me. The jukebox noise was generated by a building crew working on some new accommodation who were having a few beers and barbecuing their dinner. Everybody was friendly and they offered me a steak, but the lasagne was already en route. The tavern was originally a police station dating from the 1880s with lots of historic stonework, woodwork and artifacts. I was very tired and badly in need of a shower by the time I finished my dinner at 8pm. As I headed to my room, they offered me some bread, butter and peanut butter to use for breakfast since they did not expect to be up. It was very generous of them and I just cut off the mould that was on the bread when I reached my room. I showered and washed out some clothes before updating my diary while watching a DVD on the TV which had no aerial/sattelite connection. What had seemed like a day of small problems had turned out OK and I had met some very nice and helpful people along the way.